the above sections on this page are more or less in date order. An ancient crossing of the River Avon from Rownham Hill to Hotwells & post 1877 from Ashton Meadows to Cumberland Basin. Ship wrecks: Auguste (Cargo Vessel - Collision, 1888), Eclipse (English Ketch - Stranded, 1892), Red Rover (Passenger Vessel - boiler exploded, 1850) and many more ..
1,000 metres also include quite a lot of information of the Lock Gates and old Ship Yards of Bristol Docks. Burgh Walls or Bower Walls Iron Age Temple? 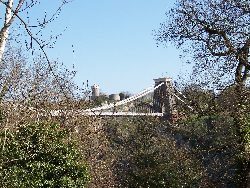 Burwalls Wood lies between the Police Station on Clanage Road and Leigh Woods, with Burwalls House (below left) very close to the Clifton Suspension Bridge. Burgh Walls (which may also have been known as Bower Walls) was a 3 hectare (4-5 acre) iron age set of earthworks, not lived in, it may have been used as a temple. Dated about 150 BC on the hilltop built by the iron age tribe who lived in this area the Dobunni. Its one of two on the gorges west side the second just a little further down the gorge is Stoke Leigh. The name Burgh Walls (I assume) has come down to us as Burwalls. Mentions of a second mansion at Lower Court (by the UWE) and Roman remains near the Police station (Burwalls) in National Gazetteer (1868) - Long Ashton. 'Circumvallations' (fortifications) around a military site in Walks and Rides in North Somerset (1824) up the hill from Rownham Ferry. The orchard mentioned in the first link above, is still there. With a public footpath running through it. Its the quickest way (by foot) to get to Leigh Woods, it also avoids crossing the A369 (twice) on Rownham Hill. Walk along Clanage Road, go right after passing the Police Station. then immediately left into the woodland, this quickly takes you through the wild orchard. If you continue upwards you reach Leigh Woods through the National Trust's Rownham and Burwalls Woods. Its a reasonable if steep woodland path with steps and the odd view. The new building at Ashton Park School, had a Archaeology Watching Brief Report, reported in Feb 2011 by AOC Archaeology Group - AOC Project No: 30338. The study included 4 trenches within the Ashton Park School area only natural or recent building debris was found. The study did however note that within Bower Ashton's boundaries, the field immediately below the Ashton Court Mansion, Roman Pottery finds were noted during early 20th Century pipe laying. The Victorian map shows the site of St. Johns Chapel in the pasture opposite the Smthye Arms (now the Dovecote). On more recent maps it shown as St. James Chapel as it does in a recent archaeological report made during a partial rebuild of Ashton Park School ending in February 2011. A Wessex Archaeology report in 1996 estimated that the chapel and the likely village of Bower Ashton it supported was deserted at sometime in the 13th or 14th Century. My added assumption is that this was caused by the Black Death that reached England in the Mid 13th Century. Pastscape.org.uk: ST JAMES CHAPEL in Chapel Acre. The nearest pub and restaurant is just outside of the Bower Ashton boundary, its one of our areas oldest buildings, in parts dating back to the 1650's. When a national chain bought the Smyth Arms and renamed it 'The Dovecote'. I thought it was a shame to lose the local connection with the Smyth's of Ashton Court. It is after all very hard to miss the south face of the Smyth family's mansion house on the hillside above the building. Its worth noting though that pubs have always changed names to take advantage of what's popular at the time. A 1840 map I came across gave the pub the name of the Coach and Horses. The Dovecote was seriously damaged by fire in 2014 and re-launched as The Ashton. The Drum footpath runs from The Dovecote/Smyth Arms to the end of Parklands Road. The Drum footpath has a good view of nearby Ashton Court Mansion and a very attractive line of mature trees running beside the path, despite the rather ugly Ashton Park School security fence. Mentioned in Anton Bantocks books when a fraudster claimed Ashton Court's inheritance when there was no direct male line to inherit. The Strawberry Fields were along Clanage Road, quite a suitable name as Clanage means field free of weeds. 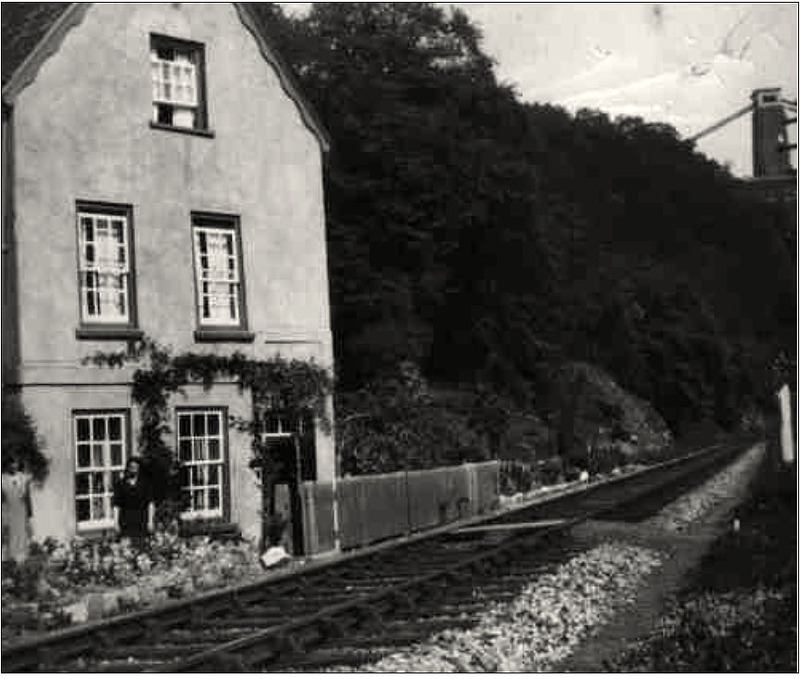 Wellington Cottage was a small cottage immediately opposite the Bristol Docks entrance and demolished on the 24th November 1954. Know Your Place: Wellington Cottage. Ashton Meadow Sidings from Ashton Meadow in 1913. The footbridge over the railway line is still there, with the Police Station (mounted police and dog section buildings) now immediately behind the foot bridge from this viewpoint. Note the rowing boat on the right hand side on Colliter's Brook. Colliter's Brooks is now culverted in this area and tidally controlled. You can also just about see the path leading down to the riverside and Rownham Ferry, near the centre of the photo. There is no real physical reminder of the 1914 Bristol International Exhibition remaining. 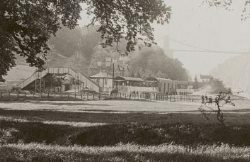 The 'White City' was a local name for the event, which at least retains one local link with the White City Allotments, accessed from the Stone Yard roadway off of Clanage Road. 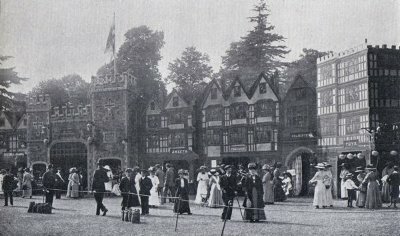 The exhibition consisted of English buildings through the ages (above), plus the large white pavilion shown in the Flickr photo link below. It was held in Ashton Meadows now the riverside land beneath and around Brunel Way next the River Avon. Reece Winston's Bristol as it was books have quite a few photos on this. They note the new use of early flood lighting, very likely supplied by Christy Brothers electric generators at Kennel Farm. Hi tech Bower Ashton? Not now but before WW2 Bower Ashton was the head office of the North Somerset Electric Supply Company. With a 33kV generator (the largest in the area) at Kennel Farm - see the 19th C Map top right or the St. Johns Chapel close up above. 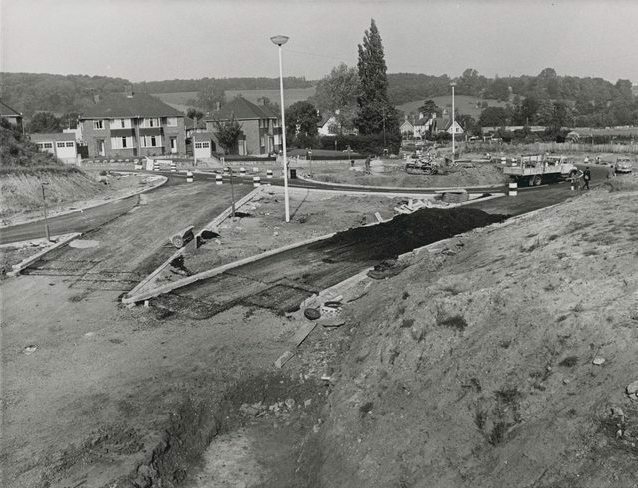 Kennel Farm is long gone now, beneath the A370, the Park and Ride and other developments. There were two American bases in the area, one between Ashton Vale and Bower Ashton, near Colliters Brook. The second was in Ashton Court with Nissen Huts in Summerhouse Plantation. Ashton Court was also used to hide various military vehicles prior to the D-Day (6th June 1944) invasion. Many thanks to Midge for the photo.